I love the colors and flavors of the fall season.The breath taking beauty and bounty in nature all around us, at Thanksgiving time, is so inspiring! Mother Nature motivated me to create this salad,that I feel is rich in color, taste and texture. 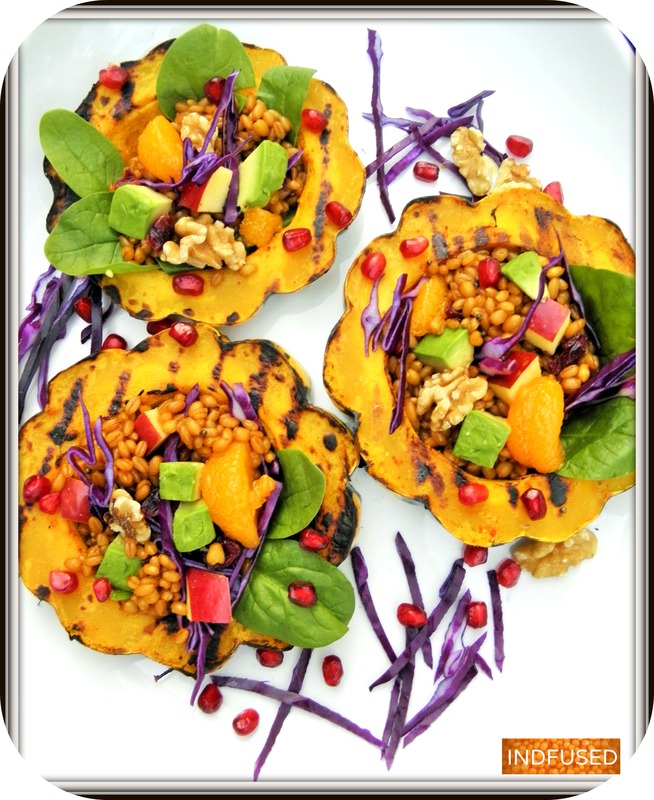 And of course it is healthy too with the wheat berries, vegetables, fruit, walnuts, extra virgin olive oil, avocado and turmeric. ” You use turmeric in Indian cooking right? How do I use it ?” I have been asked that question so many times. A lot of people want to incorporate turmeric powder in their recipes and do not know where or how to. Well how about using it in a salad….like this one? I use it in many of my recipes like Festive soup for Thanksgiving, Touchdown chili , Kheema Calzone and the Rice Bowl with Potato curry ,to name a few. In this recipe I used it three times! 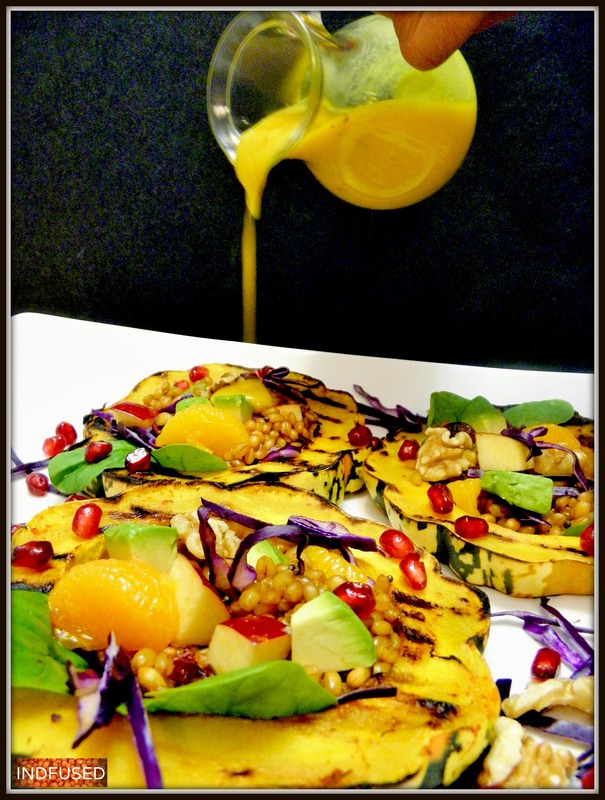 To infuse the wheat berries and the dressing and also on the grilled carnival squash. I know what you are thinking….carnival squash again? Yes because it is so easy to use! Plus I loved its mellow, sweet taste. Sprinkled with turmeric powder, salt, chili powder and grilled, it gets a party going in your mouth! The wheat berries are a favorite of mine for their nutty taste and chewy texture. Also they seem to ‘soak up’ the flavor of the spices used in cooking. I get the wheat berries at Whole Foods. I wash and soak the berries in warm water, preferably overnight, so they area breeze to cook the next day. I just boil them in water with a touch of sea salt and drain them. 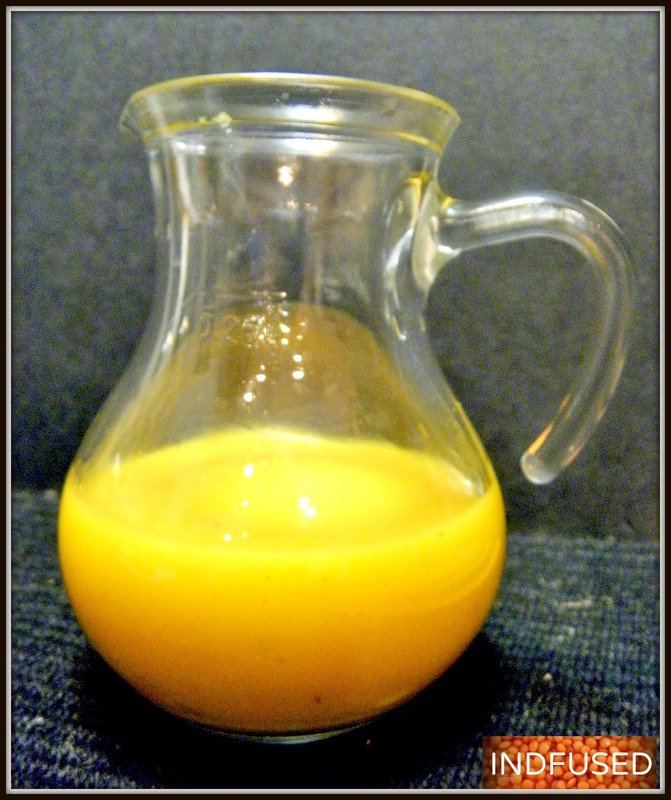 1 cup of the cooked squash. 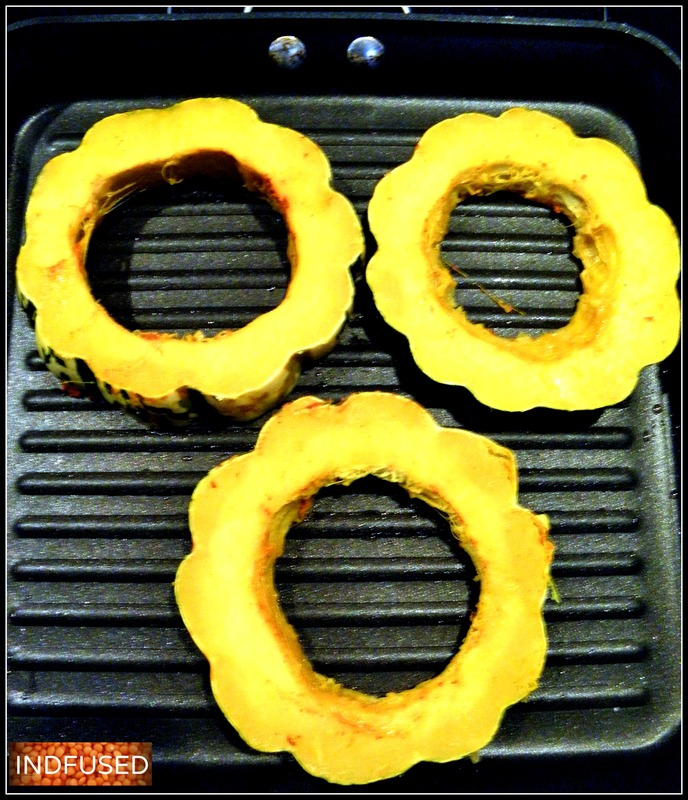 I used the two ends of the cooked squash left after cutting the rings. dried cranberries (I used Ocean spray craisins), walnuts. Cook the carnival squash as directed in Festive Soup for Thanksgiving but cook it for 8 minutes instead of 12 minutes. Set it aside to cool. In a saucepan, heat the oil and butter over medium heat. Add the curry leaves, green chili, mustard seeds, asafetida, chili powder and turmeric powder. when the mustard seeds start to sputter, add the wheat berries and toss to coat the wheat berries with the spices. Add the sea salt and let the mixture heat through. Remove from heat, sprinkle the lime juice and set aside to cool. Cut the carnival squash into slices, about 1/2 inch thick. Sprinkle both sides of the slices with the turmeric, chili powder and salt. Grill both sides of the rings over medium heat. I used a grill pan. For the dressing-Heat the oil over medium heat. Add the mustard seeds, asafetida, turmeric powder and chili powder. When the mustard seeds start to sputter,add the cooked squash flesh and toss to coat it with the spice mixture. Remove from heat. Cool to room temperature. In a blender add the cooked squash mixture, juice and sea salt and blend to make the yummy dressing! Arrange the salad in the squash rings and serve with the dressing on the side. Enjoy the splendor of the fall season! Have a great weekend! Oven Roasted Delicata Arches ! Yummy Yams and Savory Sweet Potato Swirls! Gorgeous colors, the essense of the fall season! I will try the rub on some squash I purchased at the farmer’s market yesterday. Thank you for the idea. Hi Liz, Thank you! I love the colors and tastes of the fall season. The rub will taste good on squash. Let me know how you like it. The invention of this salad should be published in a magazine. See if you may enter a contest with it, Sandhya. I love your beautiful flavors described here and the lovely photos are so colorful. Perfect presentation! Thank you Robin for your encouragement and confidence in me! I am so flattered! The berries in my recipe are wheat berries and the ones you see on the salad are pomegranate arils.